Zhang, Z., Jing, P. and Gao, Y. (2016). Microinjection of Virus into Lumbar Enlargement of Spinal Dorsal Horn in Mice. Bio-protocol 6(22): e2020. DOI: 10.21769/BioProtoc.2020. In order to explore the role of a specific gene/protein in the specific segment of the spinal cord, the technique of intraspinal injection is particularly used to deliver viral vectors targeting the specific gene/protein. These viral vectors can knockdown or overexpress the specific gene/protein in specific cells (glial cells or neurons). In this protocol, lentivirus containing shRNA for CXCL13 were injected into the dorsal horn of the spinal lumbar enlargement segment (Jiang et al., 2016). This technique allows the study of the role of CXCL13 in the ipsilateral dorsal horn in neuropathic pain without affecting DRG or contralateral dorsal horn. The dorsal horn of spinal cord is a well-organized and stratified neuronal complex, which transmits the sensory information from the body surface and deep tissues to the brain. The activity of neurons in the spinal dorsal horn can be regulated by primary afferents, descending fibers, as well as spinal glial cells such as astrocytes and microglia. Understanding how the specific protein and gene in spinal neurons or glial cells contribute to the mechanism of physiological and pathological pain is of increasing interest. In order to explore the role of a specific gene/protein in the spinal cord, the technique of intrathecal injection is commonly used to deliver agonist, antagonist, siRNA, or miRNA into the subarachnoid space. The knockout and conditional deletion of a specific gene is another exhaustive and expensive approach. However, the limitation of these methods is lack of spinal segment- and cell type-specific deletion or overexpression. This protocol shows that intraspinal injection can deliver specific viral vectors into specific segmental spinal dorsal horn to investigate the function of a gene in a region- and cell type-specific manner. Note: The recombinant lentivirus containing CXCL13 shRNA was packaged using pGCSIL-GFP vector by Shanghai GeneChem Lentiviral vector. (CXCL13, GenBank Accession number: NM_018866). Figure 1. The components of microinjection system. A. This system is composed of spine clamps, stereotaxic instrument, and microsyringe pump. The spine clamps are used to fix the vertebral column, and expose the surgical site. 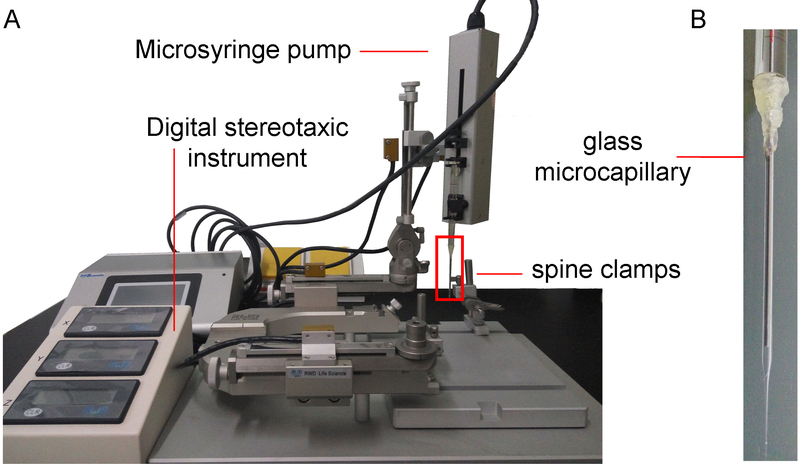 The stereotaxic instrument with digital controller is used to guide the glass microcapillary to the spinal injection point. The microsyringe pump is used to withdraw and infuse the virus solution, and control the speed of injection. B. The enlargement of the part in the red rectangle in (A). The glass microcapillary is connected to the microsyringe with heat glue, and filled with liquid paraffin. Note: The liquid paraffin that is used to fill the microsyringe and glass microcapillary may be toxic to the nervous system. In order to prevent the liquid from touching the nervous tissue, more than 1 μl of the virus solution is filled at the first time, and no less than 0.5 μl is left in the glass microcapillary at the end of every injection. A recent report has used the high-pressure air (600 hPa) to inject the virus solution into the spinal dorsal horn (Kohro et al., 2015). Prepare the glass capillary: the glass capillaries are pulled by a P-97 micropipette puller with the heat: 850, vel: 30, and time: 250. Trim the tip of the glass capillary tube with scissors under operating microscope, so that the tapered tip has an outer diameter of about 50 μm. Insert the tip of glass microliter syringe (type of volume 10μl) into the glass capillary, and seal the junction with hot glue (Video 1). Fill the glass microliter syringe and glass capillary with liquid paraffin, evacuate the air in them. Fix the microinjection set on the desktop digital stereotaxic instruments. Video 1. The components of the microinjection system. This video described how the microinjection system was prepared. The LV-CXCL13 shRNA (1 x 109 TU/ml) stock solution is diluted into working solution (2 x 108 TU/ml. 0.5 μl for each injection, 2 injections for each animal) using Enhanced Infection Solution and kept in ice. Mice are anesthetized by intraperitoneal (i.p.) injection of pentobarbital sodium (40-50 mg/kg). After anesthesia, mice are placed on a 37 °C heating mat on surgical table. The skin of the middle back of mice is shaved by a pet trimmer. The surgical site is cleaned with 75% ethanol (3 times), following by 1% povidone iodine(3 times). All the procedures of surgery and virus injection are performed in the biological safety cabinet. The operators use gloves and masks during the performance. All the instruments of surgery are sterilized with 75% alcohol. 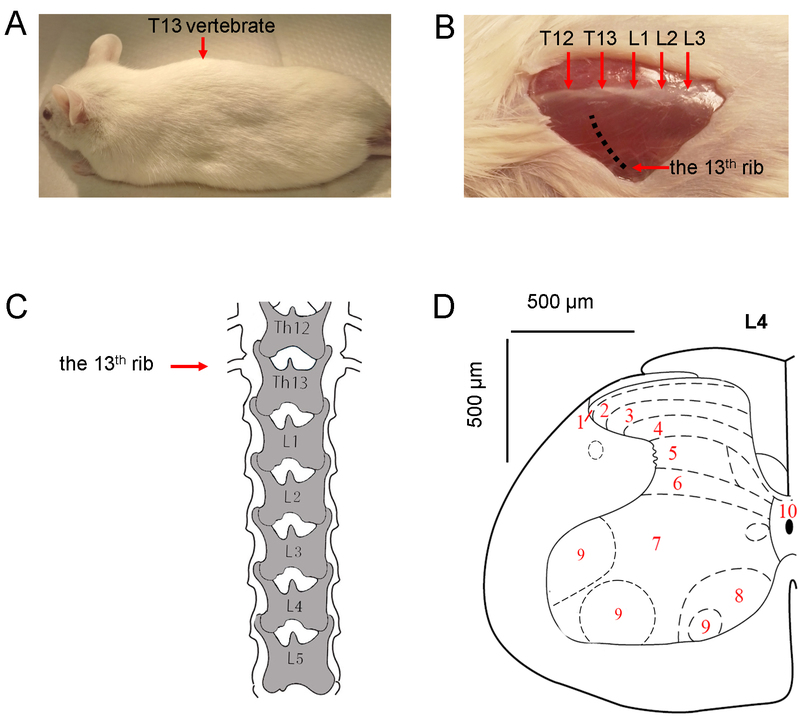 The shaved back of the mouse is covered by aseptic gauze with a hole in the center, and a sagittal incision (about 1 cm length) of the skin is made at the level of the Th12-L3 vertebrate (Figure 2). The skin incision is made by a scalpel, and the bleeding is stopped with cotton swaps. Figure 2. The position of skin incision and the schematic of the spinal column and L4 spinal cord. A. The highest point of the back is around the 13th thoracic vertebrate, when mouse is lying on a table. B. After making a skin incision, the 13th rib (the last rib) is used to locate the 13th thoracic vertebrae. C. The schematic shows the position of 13th rib and thoracic and lumbar vertebrate. D. The schematic shows the distribution of laminae in mouse L4 spinal cord. The spine column of mice is fastened with the spinal clamps apparatus at the rostral and caudal sites of the incision respectively (Figure 3). The ipsilateral side (corresponding to nerve injury) paraspinal muscles on the surface of Th13 and L2 vertebrae are carefully removed by microscissors. The surface of the Th13 and L1 is cleared with cotton swaps. The left part (ipsilateral to the nerve injury) of the L1 vertebrae is removed with the skull drill, and the soft connective tissue in the vertebral space between Th13 and L1is cleared with the microforceps to expose the dura mater of spinal cord. The three layers of spinal cord membrane are carefully removed using the 30 G insulin syringe (0.5 mm lateral to the midline). The procedure is performed under the surgery microscope. The tip of the 30 G insulin syringe is inserted obliquely into the membrane and then pulled up lightly. A hole is made on the membrane, and the glass capillary is inserted into spinal cord through the hole. The glass capillary is fixed in the stereotaxic instrument, and filled with 0.5 μl lentivirus working solution using the Legato Syringe Pumps, and then inserted into the spinal dorsal horn. The speed and depth of glass capillary are controlled by the digital stereotaxic instrument. The tip of capillary reached to the level of lamina IV (about 0.4 mm in depth from surface of spinal dorsal root entry zone) of the spinal cord (Figure 2). Figure 3. The surgical instruments and spinal injection site. A. The set of surgical instruments are used to remove the vertebra. The diameter of the drill is 0.5 mm. B. The mouse vertebral column is fixed by spine clamps. LV-CXCL13 shRNA is filled into a glass microcapillary and injected into the spinal dorsal horn. Scale bar = 100 μm. C. Four days after injection, mouse is perfused with PBS and 4% paraformaldehyde. GFP is shown in the ipsilateral dorsal horn. Scale bar = 200 μm. After 2 min for allowing the nervous tissue to accommodate the glass capillary, the lentivirus solution is injected at the speed of 50 nl/min. At the same time, the glass capillary is withdrawn at the speed of 50 μm/min to ensure the infection from lamina IV to lamina I. Two injections are made for each animal with 0.5 μl for each injection. After microinjection, the dorsal muscle is sutured with 4-0 silk. The incision skin is pulled together using forceps and sutured using surgical needles. The mice are kept on a heating pad until the mice woke up. The vertebral lamina is polished thinner by the drill, and then removed by microforceps. The drill should be carefully handled to avoid penetrating the bone. A recent literature showed that a microcapillary can be inserted into the spinal dorsal horn parenchyma through the intervertebral space between Th13 and L1 vertebra (Kohro et al., 2015). Their method is suitable for 1 point injection. Our surgical field is big enough for 2-3 points injection. To test the infection of CXCL13 shRNA lentivirus vectors in the spinal cord, the double staining of immunofluorescence is used. Four days after intraspinal injection, animals are deeply anesthetized with isoflurane. When lacking the corneal reflex, they are perfused through the ascending aorta with PBS followed by 4% paraformaldehyde with 1.5% picric acid in 0.01 M PBS. After the perfusion, the lumbar spinal cord segments are removed and postfixed in the same fixative overnight. 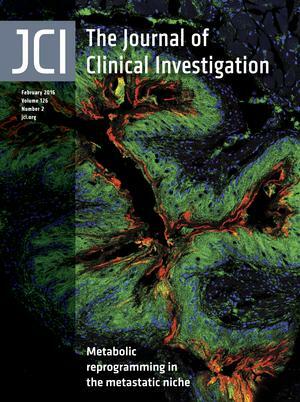 Spinal cord sections (30 μm, free-floating) are cut in a cryostat and processed for immunofluorescence as we described previously (Jiang et al., 2016). To examine the cell types that expressed the GFP, the sections are immunostained with GFAP, ionized calcium binding adaptor molecule 1 (IBA-1), and NeuN. Throughout the dorsal horn of spinal cord, GFP is primarily localized in NeuN-positive neurons or GFAP-positive astrocytes and some IBA-1-positive microglia (Jiang et al., 2016). The intra-spinal injection protocol was funded by the National Natural Science Foundation of China (NSFC 81571070, 31371121). This intra-spinal injection protocol was developed and used in articles published by Jiang et al. (2016), Lu et al. (2014), and Zhang et al. (2012). Jiang, B. C., Cao, D. L., Zhang, X., Zhang, Z. J., He, L. N., Li, C. H., Zhang, W. W., Wu, X. B., Berta, T., Ji, R. R. and Gao, Y. J. (2016). CXCL13 drives spinal astrocyte activation and neuropathic pain via CXCR5. J Clin Invest 126(2): 745-761. Kohro, Y.,Sakaguchi, E.,Tashima, R.,Tozaki-Saitoh, H.,Okano, H.,Inoue, K. and Tsuda, M. (2015). 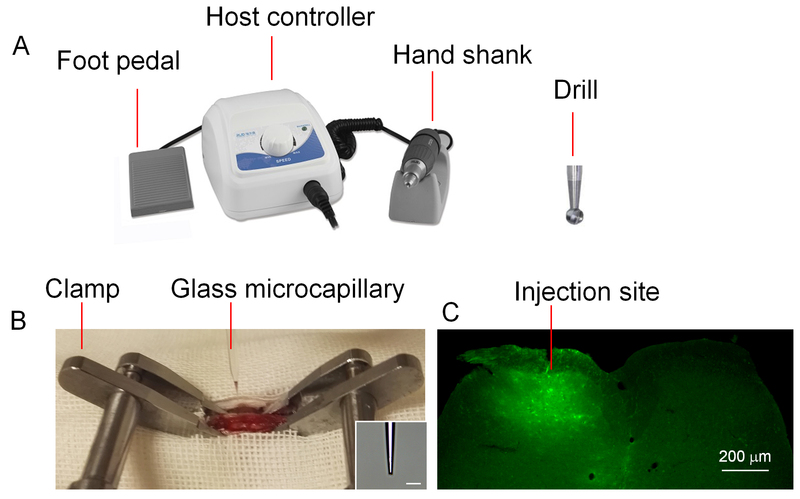 A new minimally-invasive method for microinjection into the mouse spinal dorsal horn. Sci rep 21(5):14306. Lu, Y., Jiang, B. C., Cao, D. L., Zhang, Z. J., Zhang, X., Ji, R. R. and Gao, Y. J. (2014). TRAF6 upregulation in spinal astrocytes maintains neuropathic pain by integrating TNF-α and IL-1β signaling. Pain 155(12): 2618-2629. Zhang, Z. J., Cao, D. L., Zhang, X., Ji, R. R. and Gao, Y. J. (2013). Chemokine contribution to neuropathic pain: respective induction of CXCL1 and CXCR2 in spinal cord astrocytes and neurons. Pain 154(10): 2185-2197. How to cite: Zhang, Z., Jing, P. and Gao, Y. (2016). Microinjection of Virus into Lumbar Enlargement of Spinal Dorsal Horn in Mice. Bio-protocol 6(22): e2020. DOI: 10.21769/BioProtoc.2020.